Porgs are the low-key MVP of Star Wars: The Last Jedi. They’re cute, fluffy, and have a-d’aww-able eyes. So, you’d think baby Porgs would double down on being oh-so-huggable, right? Wrong. So very, very wrong. I feel like I should give some sort of warning. They’re so gross and potentially NSFW, lest you throw up on your keyboard. Coming from Japanese website natalie.mu (via CinemaBlend), the toy line shows off what looks like mini-Snoke heads nested on some icky uncooked noodles. If nothing else, they look like they’d make a mighty fine breakfast – and it’s probably what Luke has been snacking on after all those years in exile on Ahch-To. 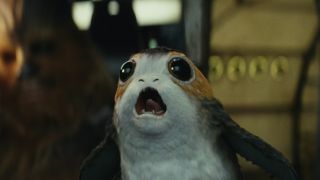 Like a butterfly breaking free from its cocoon, Porgs eventually turn from hard-boiled hell-creatures to everyone’s favourite furry bird… thing. I just hope these Baby Porgs don’t show up on screen for long, because I don’t think the movie would survive being R-Rated. We’ve seen Baby Porgs, normal Porgs… what next, elderly Porgs? Disco Porgs? I feel like we’re definitely going to get a Minions-style Porg spin-off down the line. Just keep those monsters away from it – and out of my dreams. Looking for something a little less balls-to-the-wall creepy? Star Wars: The Last Jedi would have featured an evil Luke clone if it was up to Mark Hamill (that’s still pretty creepy). Wait, I’ve got another one: Star Wars: The Last Jedi subtitles may reveal who Snoke and Luke were talking to.